Forty #1s. Five decades of charted singles. Creating a new way of recording (being blind, his hyper-attuned hearing led him to create/build what is now known as Ronnie’s Place, where the new album, the Duets, was captured), he broke genre rules and became one of the biggest pop/AC and even R&B artists of the late ‘70s and early ‘80s. Always chasing the music, always hungry for the songs, he is now an inspiration for a new generation of country stars from critical standard setters Kacey Musgraves and Little Big Town to CMA/ACM Entertainers of the Year Luke Bryan and Jason Aldean, as well as a standard-setter for friends like Dolly Parton, George Strait, Willie Nelson and even groundbreakers Leon Russell and Billy Gibbons. 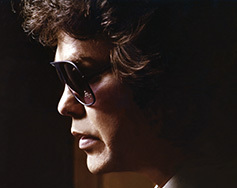 Born blind (his family thought it was retribution for sin), Ronnie Milsap’s grandparents gave the boy over to the North Carolina State School for the Blind hoping for a better chance. There, Milsap discovered music – deviating from the school’s classical curriculum to explore the nascent realms of race music, rock & roll and jazz. Being the brilliant kid he was, it wasn’t long until he’d found his way into the local clubs and the tiny indie labels. Suddenly, he was sharing bills with Ray Charles (who took the Ashford & Simpson-penned B-side to Milsap’s Scepter single “Never Had It So Good” and scored his own hit with “Let’s Go Get Stoned”), and James Brown on a circuit that included the Howard Theater, the Royal Peacock, and more. Living in Atlanta, playing clubs and doing sessions the future Country Music Hall of Famer caught wind that JJ Cale was looking for a keyboard player. Cale hired him. Ronnie went on to work at the Whiskey for a good while. From Atlanta, Ronnie moved to Memphis where he was doing sessions with Chips Moman, where Elvis famously commanded, “More thunder on the keys, Milsap,” during the recording of “Kentucky Rain.” It was there he was asked to play the Whiskey on the famed Sunset Strip in LA. While staying at the notorious Hyatt House, Charley Pride, a famous man in country music, saw the white kid playing rock & soul and suggested giving Nashville a try. In a world of marketing match-ups, the Duets is an homage to blurring lines, great songwriting, and vocals that celebrate soul over product – something rare in today’s flashcard jingle country.